Frank Young’s quest to learn about his birth father unlocks a chain of events that will forever alter his life. His travel visa is revoked without explanation, forcing him to return to the United States, where he is taken into custody by the FBI and then driven to a private meeting with President Nixon and his Security Council. In this meeting, a small glimpse of his father’s mysterious past is revealed to him. President Nixon coerces Frank to go undercover into the Philippines to resume his father’s task of discovering the locations of buried World War II gold. But it comes with a hook—he must also unravel the secrets of Philippine President Ferdinand Marcos’ wealth. The more Frank learns about the gold, the more challenging his task becomes. While Frank worries about Marcos’ blood-thirsty bodyguard, he discovers the people he trusts most have deceived him throughout his life. As the Marcos presidency crumbles, Frank becomes ensnared in a struggle to complete the mission for his country in time to escape the islands alive. 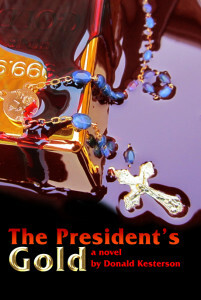 Purchase The President’s Gold as an ebook through Kindle.